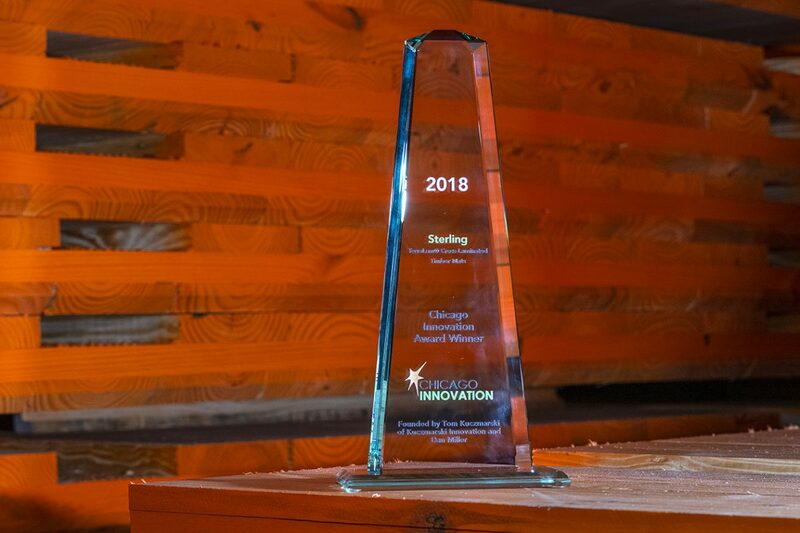 Recognizing the significant economic and environmental impact of the TerraLam® site access mat, Sterling was presented with a Chicago Innovation Award during the 17th annual Chicago Innovation Awards Monday, October 29, 2018, at the Harris Theater in Chicago. TerraLam is eliminating the false perception among contractors and utility owners that they must choose between sustainability and profit, because with TerraLam you get both. TerraLam CLT mats use sustainable southern yellow pine (SYP) to create a site access mat that is lighter, faster, and longer lasting. TerraLam mats are used primarily in the power transmission and distribution, oil and gas pipeline, and civil construction fields. Site access mats are used to protect sensitive or undisturbed soil in rights-of-way from tires and tracks of heavy construction equipment. CLT panels were developed in the 1990s and used in structural construction. Sterling’s challenge was evolving existing CLT standards to the site access industry while increasing production capacity to fulfill demand. TerraLam was born out of extensive R&D and testing. To keep the mats light yet strong, Sterling selected renewable southern yellow pine with an optimized adhesive system for their next generation CLT mat. The strength and durability of this engineered product has been validated by independent laboratories including the USDA Forest Products Laboratory and San Diego State University. Because TerraLam CLT mats are constructed with farm-raised southern yellow pine, they are a vastly more sustainable option than traditional hardwood mats. SYP grows to maturity in as little as 20 years, a dramatic difference to the 80 years required for hardwoods such as Oak and Maple, which are traditionally used for bolted mats. Sterling also developed an automated manufacturing system to dramatically scale up the production process to meet the demand of the site access marketplace. Previously, dozens of CLT structural panels could be produced every day; however, Sterling’s automated manufacturing facility can create more than 1,000 CLT mats every day. Sterling also deviated from the traditional structural CLT practices by developing Cross-Grain Technology™, which means changing the direction of the board layering to increase the wear characteristics required for trucks and heavy construction equipment. By changing the direction of the grain to match the direction of traffic, Sterling was able to maintain high strength performance while significantly improving durability and expected product life.